What do you want to do when you retire? I'm guessing paying down debt isn't on your short list. Unfortunately, for many Americans it is. Mortgages, credit card debt, student loans and supporting elderly parents are affecting the retirement plans of many baby boomers. The financial crisis devastated home values and retirement accounts, and a general lack of planning left little time for boomers to recover the losses. A Fidelity Investments survey showed that almost half of all baby boomers who have pensions expect to retire with debt, with one if five of them saying they did no planning before retirement. Also, a 2012 Demos study found that people 65 and older have more credit card debt than any other age group -- $9,300 on average. Demos suggested that the recession reduced savings and forced those in or near retirement to cut back. "I don't think people are making a conscious decision to carry debt," Lori Trawinski, senior strategic policy adviser at AARP Public Policy Institute, told Kiplinger. "People have no choice, because they have other obligations they need to take care of." If you are nearing retirement or already retired, how do you pay down debt? Here are eight ways to get some relief. 1. Consult a professional. A certified financial planner can help you build a retirement plan, including specific benchmarks so you can dig out of debt and build savings. A CFP can also help you build an overall retirement spending plan that includes debt payments, fixed expenses and anticipated sources of retirement income. 2. Know your benefits. The National Council on Aging, a nonprofit service and advocacy organization that improves the lives of older adults, runs a website called BenefitsCheckup.org. The site has a tool to help you make sure you are receiving all the benefits you are entitled to. These benefits can help you pay for medications, health care, food, utilities and more. 3. Downsize. This is a very emotional decision but selling your house and moving into something much smaller and more affordable will free up cash for living expenses. Ditching your high-maintenance house means you will be free of high mortgage payments and expensive maintenance, insurance and tax bills. 4. Accelerate your mortgage payments. This is only a good option if you have mortgage debt and cash in the bank; this route is not for retirees with other kinds of high-interest debts or low cash reserves. If you compare the interest rate on your mortgage with the current rates on savings accounts and CDs, you might save more money paying down the mortgage instead of keeping the money in the bank. Just don't withdraw from your retirement accounts to pay off the house -- the tax owed on the distributions will cancel out the mortgage savings. 5. Refinance your mortgage. Some retirees have enough equity to refinance their homes, pull out cash, invest the money and try to live off the investments. Retirees might want to avoid using mortgage relief firms, as some debt settlement programs can leave you paying more than the original debt owed. If you do use a mortgage settlement firm, know that the FTC bans these firms from charging upfront fees. Also, be wary of short-term interest rate deals -- those rates can spike later. 6. Get a reverse mortgage. There are risks associated with reverse mortgages: They generally have high fees and interest rates. Also, the loan must be repaid with accumulated interest when the owner passes away, sells the home or no longer uses it as his primary residence. Reverse mortgages are one of the biggest scams targeted at the elderly. Still, they are an attractive option because retirees do not have to make monthly principle or interest payments while living in the home, although they must stay current on tax and insurance premiums. Retirees considering a reverse mortgage should consult a government-approved housing counselor for help. 7. Postpone retirement. Postponing retirement gives you more time to bring in income and pay down debts. Working later means you can also delay claiming Social Security benefits or other sources of retirement income, which gives your savings extra time to compound. This might be a tough pill to swallow if you've had your eye on retiring sooner rather than later, but just a few extra working years might be all you need to eliminate your debts. 8. File bankruptcy. Senior citizens are the fastest growing number of bankruptcy filers. It's an attractive option to retirees, because chapter 7 bankruptcy liquidation does not affect 401(k) accounts, social security benefits or home equity. IRAs are also protected up to more than $1 million. Eliminating debts through bankruptcy makes sense for some boomers, who don't have a chance to increase their income so late in life. There are some exemptions to which accounts are or are not affected, which vary by state. It's best to consult a bankruptcy attorney to understand all the implications. 9. Ask for help. There are several nonprofit counseling agencies that help people establish a manageable schedule for repaying debts. Just avoid debt negotiation firms that charge high fees or are scams. Some trusted sources include the Association of Independent Consumer Credit Counseling Agencies and the National Foundation for Credit Counseling. Debt counselors can review your budget and spending and come up with an action plan; some can even offer a reduction or waiver of interest charges and penalties. 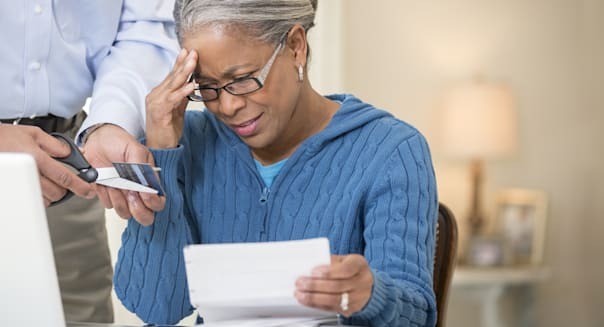 "No one should be worried about making a credit card payment versus paying for medicine," Leslie Linfield, executive director at the Institute for Financial Literacy, told Kiplinger. "You've contributed to the system your whole life. It's okay to ask for assistance." Senior citizen renters pay a median of $686 monthly to live in Albuquerque. Homeowners age 65 and older pay a median of $1,078 a month if they have a mortgage and just $368 monthly if they have paid off the mortgage. There are six senior centers where people age 50 and older can become members for just $13 a year. The low housing costs in Texas are drawing people to the state. A home in Austin costs retirees a median of $1,395 monthly with a mortgage and $545 if they own their home debt-free. The median rent for retirees age 65 and older is $887 monthly. Texas doesn't have a state income tax, but it's important to carefully consider the property tax you might face on any home purchase. If you can tolerate the cold and snowy winters, you'll be rewarded with a very low cost of living. Senior citizens age 65 and older pay just $466 monthly in housing costs if they have paid off their mortgages, $1,009 monthly if they are still paying off their home and $611 in monthly rent. The City of Buffalo also provides a senior discount card that entitles retirees to a percentage off their purchases when they shop at local businesses. South Carolina residents age 60 and older who are no longer working are eligible for free tuition at the University of South Carolina. Seniors can also get discount tickets to the Riverbanks Zoo and Columbia Museum of Art. Housing remains affordable, costing retirees $1,074 monthly with a mortgage, $367 with a paid-off house or $801 in monthly rent. This small city is known for its outsized art scene, which includes the Frederik Meijer Gardens & Sculpture Park, Grand Rapids Art Museum, Urban Institute of Contemporary Arts and the art competition ArtPrize. Retirees age 65 and older pay just $684 monthly in rent. Older homeowners pay $1,080 monthly with a mortgage and $427 a month if their house is paid off. Jacksonville offers balmy winters similar to other parts of Florida, but at much more affordable prices. Retirees age 65 and older pay a median rent of just $861 a month. Older homeowners pay a median of $1,247 a month if they have a mortgage, which drops significantly to $405 once they pay off the house. An added bonus: There's no state income tax in Florida. Pittsburgh has several professional sports teams, noteworthy museums, major colleges and the UPMC-University of Pittsburgh Medical Center, which is ranked 13th in the country in geriatrics. But housing prices remain affordable, costing senior citizens a median of $1,023 monthly with a mortgage, $434 when they have paid off their house or $614 a month in rent. Plus, residents age 65 or over ride free on the bus, T or Monongahela Incline. The Spokane River flows through downtown Spokane and can be enjoyed at Riverfront Park, one of the city's numerous recreation areas for hiking and biking. Washington state doesn't have an individual income tax, and housing in retirement is affordable, costing just $419 monthly with a paid-off house and $1,139 monthly with a mortgage. The median rent for people age 65 and older is $733 monthly. Home costs for seniors are $1,115 monthly with a mortgage and $434 a month with a paid-off house, while renters pay a median of $664 monthly in rent. There are also affordable local services to transport retirees to doctor appointments and the grocery store and help with minor home repairs and chores. The Barnes-Jewish Hospital/Washington University is nationally ranked in geriatrics. Retirees can take in the enormous cactuses at Saguaro National Park, where U.S. citizens age 62 or older can get a lifetime pass to this and other national parks for just $10. Yet this sunny city remains affordable. Monthly rent for people 65 and older is a median of $771. Older homeowners pay $1,095 monthly with a mortgage, but that drops significantly to $366 for people who have paid off their homes. Plus, the state of Arizona doesn't tax Social Security income.